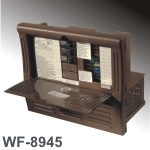 The WF-8900 Series has revolutionized RV power centers with its lighter weight, decorative doors, and superior features. The WF-8945 model provides 45 amps and a clean, constant 13.6 Vdc nominal output, for reliable operation of electronics and appliances. Automatic three-stage charging extends the life of your battery with output voltage modes of 13.2 Vdc “float” mode, 13.6 Vdc “absorption” mode, and a 14.4 Vdc “bulk” charge mode. The 8900 Series also maintains peace and quiet, as the cooling fan runs only when needed. FCC Class B compliance for every power center model means that the units do not cause interference with televisions, radios or other signals. Electronic current limiting automatically shuts down the power during overload or short-circuit conditions, protecting the life of your power center and electrical system. 8900 Series models provide AC and DC distribution with innovative features. They can accommodate a 30-amp main AC circuit breaker and up to five branch circuits. Eleven-branch DC circuits are available with LED bulbs for each DC circuit to illuminate and identify open circuits.